Wing span: 1 3/16 - 1 1/2 inches (3 - 3.8 cm). Identification: Fringes are checkered black and white. 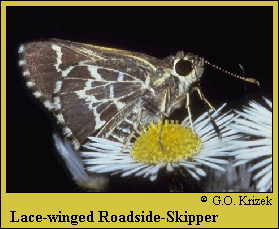 Upperside of wings is dark brown; forewing has a row of white spots. Underside is dark brown with a yellow or white cobweb pattern. Flight: Two broods from March-September. Caterpillar hosts: Probably cane (Arundinaria). Adult food: Nectar from flowers including elephant's-foot, sweet pepperbush, blackberry, white clover, selfheal, and dogbane. Habitat: Moist, dense woods with cane growth. Range: Eastern Oklahoma and east Texas east to southeast Virginia, south along the Atlantic Coast to northern Florida.